Hannah Bernard, Executive Director of Hawaii Wildlife Fund. The Hawaiian Islands, the most remote high islands on earth, located in the middle of the world's largest ocean, have at their heart the only national marine sanctuary dedicated to whales and their habitat. The annual migration of the humpback whales, from their summer home in icy Alaskan waters to their Hawaiian winter destination, is a miraculous feat. They can cover nearly 3,000 miles of open ocean in less than two months' time, but how they find their way remains a mystery. The reason why they come here, however, is more easily understood. Like all whales, humpbacks are mammals, and belong to the baleen whale suborder, mysticeti. They graze on zooplankton and small fishes in temperate and subpolar waters. 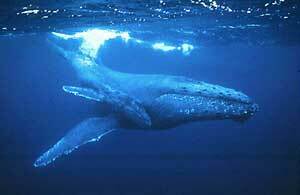 Nearly all of the baleen whales migrate some distance to warmer tropical waters to breed and give birth. The humpback whale population that comes to Hawai`i each winter is part of a much larger group that lives in the North Pacific Ocean, with feeding aggregations distributed in the Gulf of Alaska, southeast Alaska, and central California. Many members of these feeding groups migrate southward to the tropical waters off Japan and the Ryukyu Islands as well as to Hawai`i, Mexico and Central America in roughly parallel tracks, with very little exchange between the breeding grounds. The Hawaiian Islands Humpback Whale National Marine Sanctuary has been established in the heart of the largest breeding grounds for the humpback whale. It is estimated that approximately 2,000 to 5,000 individuals come here each year, a significant portion of the total North Pacific population of 6,000 to 10,000 whales. Humpback whales are not the largest whales in the world, but they are certainly the most watched. They are easily seen in sanctuary waters because of their large size and distinctive physical features, their energetic surface behaviors, and their close proximity to shore. Humpback whales are easy to identify in sanctuary waters. In comparison to other whales, they are actually medium-sized, with females tending to be larger than males, averaging 45 feet in body length and weighing approximately 40 to 45 tons. The calves are typically 14 feet at birth, and may weigh as much as 2 tons! Mature humpbacks are dark gray to black on their backs and sides, with mostly dark undersides, although some individuals have splotches of white. Humpback whales have the longest pectoral flipper of all the whales--about one third the length of the body--which can be mottled white on the upper and lower surface. The undersides of their tail flukes are as distinctive as our fingerprints, and range from all black to all white, with a whole gamut of splotching and scarring in between. The trailing edges of the flukes have a slight "S" curve and many knobby scallops and average 15 feet in width. When humpbacks dive, they often show their flukes, which researchers photograph and use to identify individuals as they come and go within the Hawaiian Islands and elsewhere. Humpback whales are classified in the balaenopterid family, which also includes the world's largest whale--the great blue whale--and the smallest baleen whale, the minke. A family trait is an expandable throat with pleats that allows these whales to engulf huge quantities of prey and water, more than 500 gallons per gulp. The early Norwegian whalers called them "rorqual" or red whales because these pleats appear pink when fully stretched by a mouthful of prey. The whales strain this writhing mass of food by pushing the water out through the baleen (the keratin structures that grow from their top jaws instead of teeth), using their one-ton tongues like a plunger. Once the food is separated from the seawater, the whales swallow it and the process begins again. A remarkable humpback trait is its cooperative feeding strategy, during which several individuals "herd" the fish in a "bubble net" that the whales create by swimming in ever smaller concentric circles. The humpbacks rarely feed, however, during their stay in Hawaiian waters. Some observers have reported seeing them feed on schools of small fish, but like all baleen whales, humpbacks have adapted to fasting during their migration and breeding seasons, while living off their fat reserves. Undoubtedly, they would eat while they were here if food was plentiful, but tropical waters are typically nutrient-poor and don't support the shoals of fish and krill that humpbacks feed on during the summer months. When males engage in competitive behaviors on the breeding grounds, they sometimes fill their mouths with water to posture; that is to make themselves look bigger. Some people may mistake this behavior for feeding activity. Another distinguishing feature of all humpback whales is their bumpy rostrum, or top jaw, which is dotted with fleshy knobs called tubercles. The early whalers also noticed these knobs and called them "stove bolts." No other whales have them, and the fact that they house a strand of hair and many nerve endings leads scientists to speculate that they may serve some sensory function. The final feature that easily distinguishes humpbacks from other whales, and for which they have received their common name, is the way they curve their back and tailstock region when preparing to dive. Humpback whales are also easy to see in Hawaiian waters because they exhibit many dramatic behaviors. On their breeding grounds, the males compete for access to receptive females, slamming each other with their powerful tail flukes, lunging at and chasing each other, and producing unique and mysterious songs. The females and young are also active, slapping the surface of the water with their long pectoral fins and tails, and hurling their gargantuan bodies into the air in spectacular breaches. Female humpbacks are also very nurturing mothers. They stay in close contact with their young while on the breeding grounds, suckle their calves for up to a year, and defend and protect them from predators and rowdy suitors. The 11 1/2-month gestation period of the humpback whale ensures that females impregnated in a given winter will give birth the following winter in the warm, sheltered breeding grounds. Calves grow quickly, sustained by their mother's fat-rich milk, and usually double in size during their first year. After feeding all summer in the cooler, nutrient-rich waters off the Gulf of Alaska, a newly weaned calf may follow its mother back to the breeding grounds the following winter. The calves also seem to learn the feeding areas their mother's prefer. By the time they reach young adulthood, between the ages of four and six, some whales are ready to breed themselves, and the cycle continues. Hawai`i is truly a unique place. The islands are like emerald specks in the center of a vast ocean of indigo blue, populated with rare plants, unique animals and warm people who always offer a friendly "aloha." We are lucky to visit the whales in their nursery, in such a beautiful setting. The steep volcanic terrain makes it easy for us to observe our enormous winter residents and their young. Because the humpback calves are born here, they are truly a "child of the land", or "kama`aina." And thanks to the many tour boats that share the whales' winter home, we are often lucky enough to have a fairly close encounter in the heart of the Humpback Whale National Marine Sanctuary. This essay was written by Hannah Bernard, Executive Director of Hawaii Wildlife Fund.